Wedding favors are one of those little details myself and my team always smile over. As destination wedding planners and photographers it is so much fun to go into a couple’s wedding reception and see what they have chosen (this is true for guests too!). 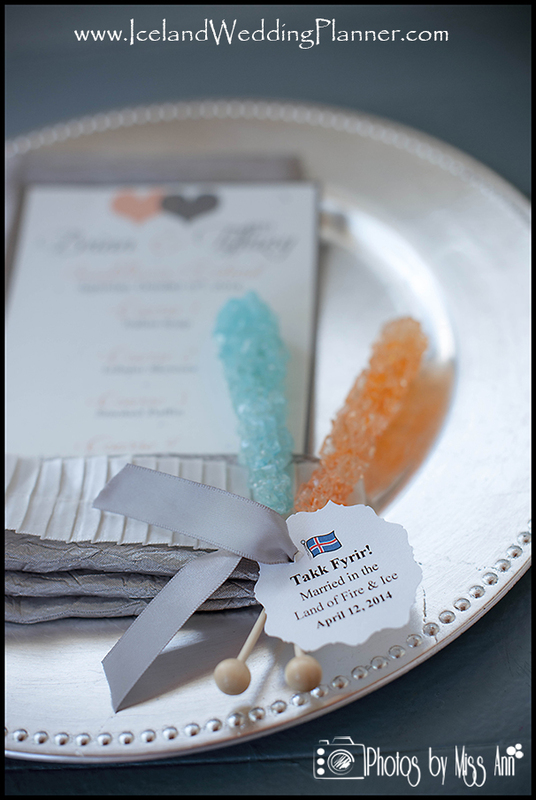 Have you decided on your Iceland destination wedding favor yet? To “thank” your guests for coming to your Iceland destination wedding. To be a reflection of your style as a couple that also compliments your wedding theme. 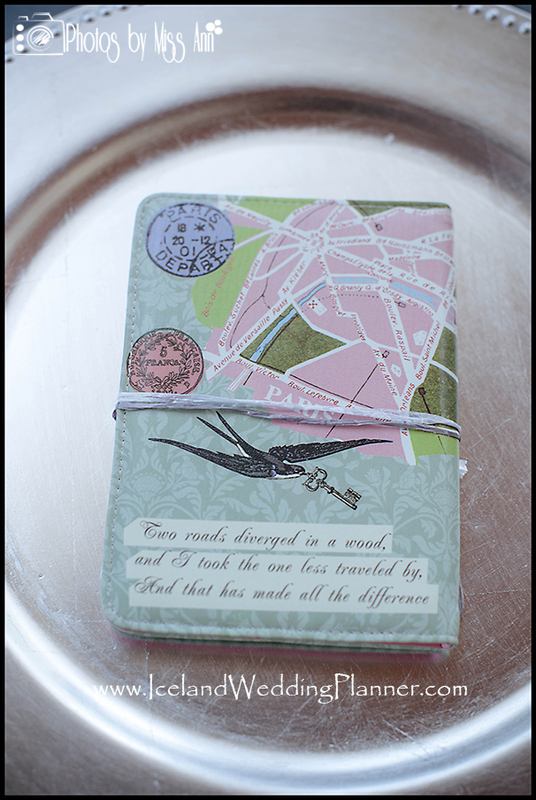 To serve as a memento to your guests of the Iceland location you have chosen. A snack for your guests if you have chosen to not have Hors D’oeuvres or a Night Glow hour. Edible – You can be simple by having M&M’s, mints, coffee/tea, caramel corn, gumballs, etc, or you can be elaborate in your edible wedding favor design. Some of our brides have had personalized treats like cupcakes, cake pops, cookies, cocktail jelly beans, mini champagne bottles, rock candy, chocolate covered items, or our personal favorite for a fall wedding in Michigan is caramel apples and apple cider! 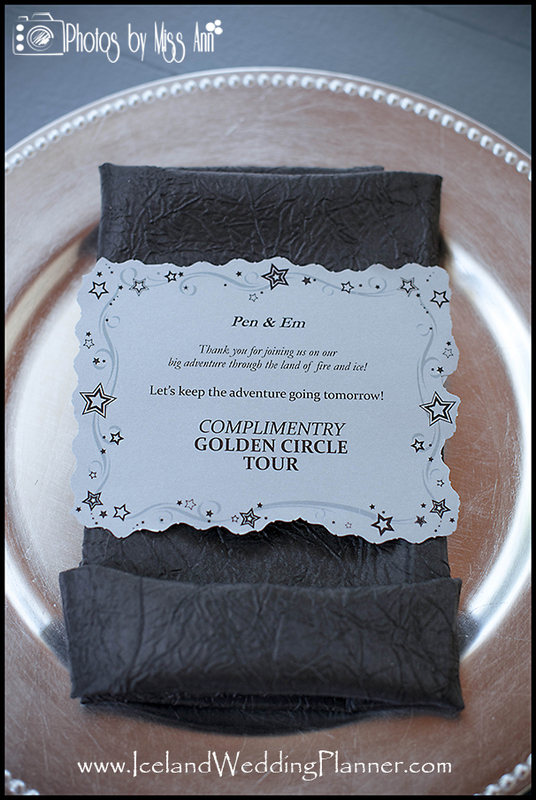 Practical –Guests love a wedding favor they can use and remember where they got it from when they use it. A couple examples of practical wedding favors that hold a lasting impression would be seed packets, wine corks, frames, cookie cutters, love measuring spoons, whisk, ice cream scoop, engraved luggage tags, cheese board/knife, passport holder, local Icelandic books (about the dynamic sites, culture, or folklore) , etc. Sentimental –Wedding favors with heart are always super sweet because they convey a special thought and detail that is usually important to the bride and groom. For instance, a destination wedding couple may choose to do a donation to their favorite charity in lieu of providing their guests with a favor. That couple might print out a small card and put it at each place setting stating why they have chosen to do so (in honor of a family member who passed away, etc). Or we have seen couples personally make a special item their guests like homemade wine, jam, sauce, so the item may be enjoyed at a later time. 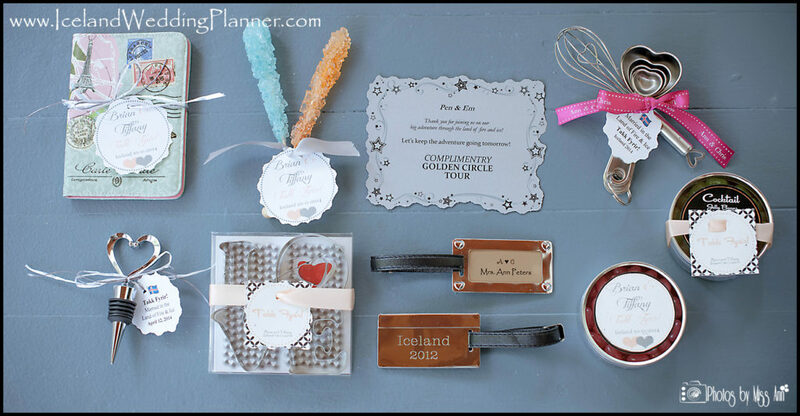 Any wedding favor that manages to emit emotion from the bride and groom to their guests is truly noteworthy. Fun –If you’re a fun loving couple who just want to make your guests smile on your wedding day with entertaining wedding favor we have seen a few couples give their guests sunglasses, sandals, shot glasses, drink cozies, etc. 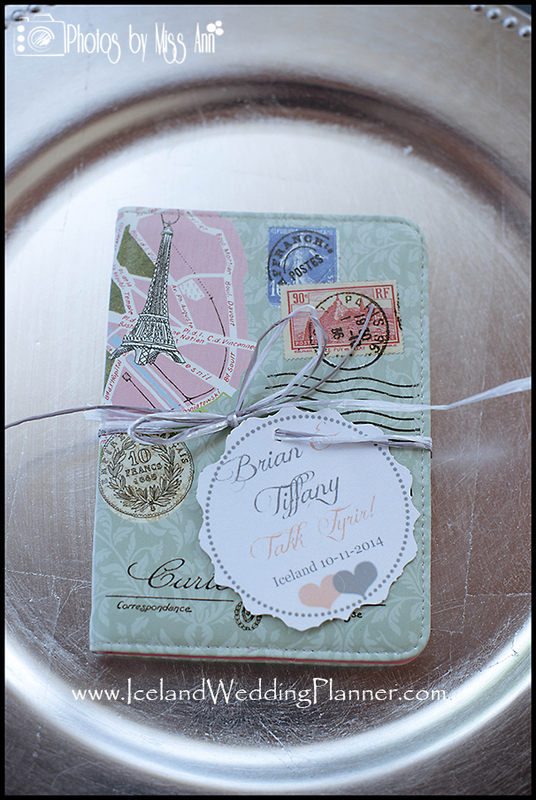 Destination weddings may also want to consider having a special memento from the state/country you’re holding the wedding in as guests usually get pretty excited for that extra detail. What should you spend on a wedding favor? There is not a specific algorithm to get the answer to this question. It frankly depends on your budget and guest count. For example, we only planned on 45 people attending our Seljalandsfoss wedding (traveling also to Vik Beach and Skogafoss during our Iceland wedding) so we splurged a little more and spent $12 per luggage favor tag. Generally though, simple or homemade wedding favors may only cost .80-$5 per person; whereas, more extravagant or personalized favors may cost $6-15 each; and the top of the line wedding favors would be $15+. Once you have decided on what type of wedding favor you are going to give your guests the next step is to determine the presentation. Ask yourself a couple of questions… Do you need certain packaging to hold everything together (wrapping, ribbon, etc.)? Is there a theme you’re trying to exude throughout the day (IE, Married in the Land of Fire & Ice?)? What will your wedding packaging and label look like? 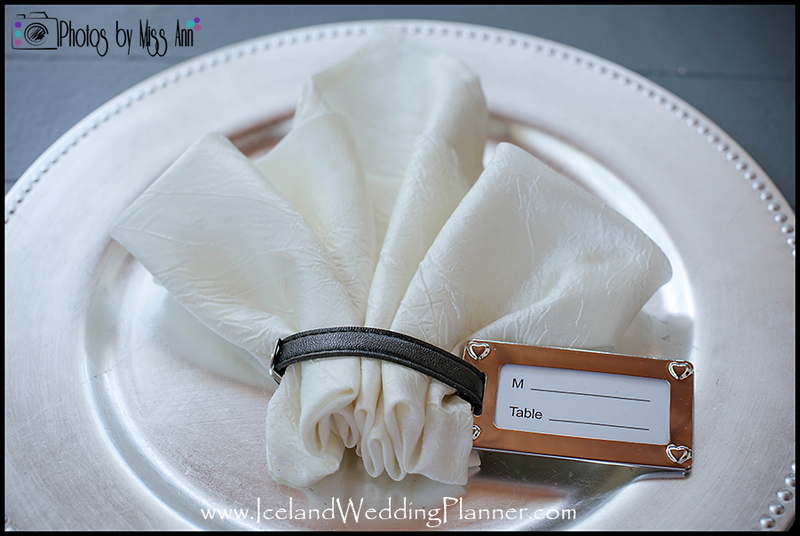 Where will your favor be positioned on the table when your guests sit-down at your Iceland wedding reception? Put your wedding date on the tag or engrave it on the item (Guests always appreciate this detail, especially when they use your gift at home later!). 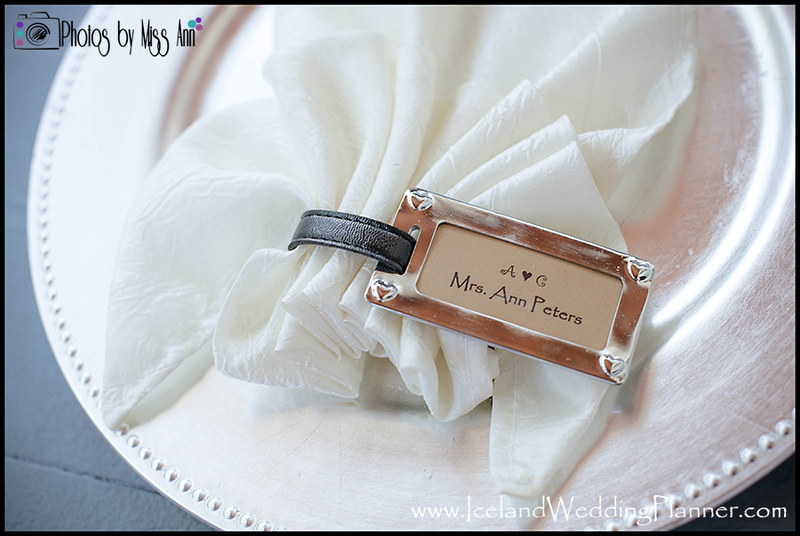 Have personalized ribbons (Iceland wedding planning tip: Double-faced satin looks the best). For our Seljalandsfoss wedding we had “Ann & Chris” printed on rolls of ribbon to use for all of our Iceland destination wedding events. 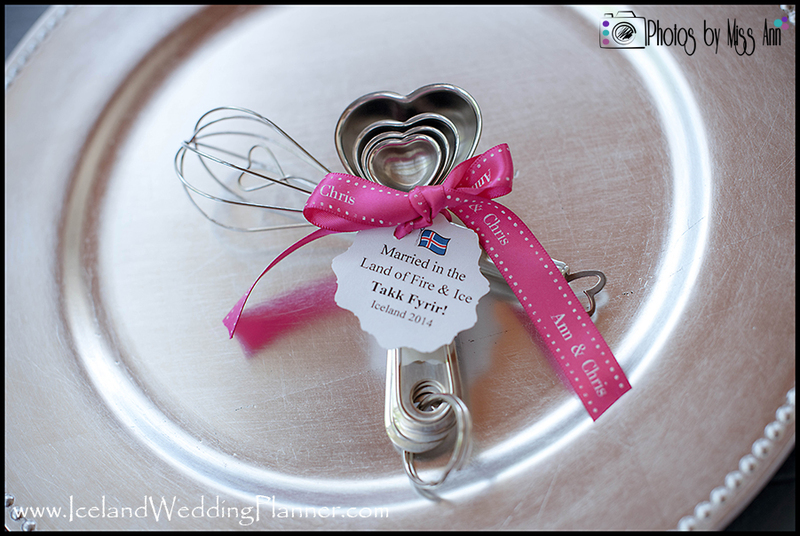 Make your wedding favor dual purpose (i.e. turn it into a place card, versatile to be used again or have it communicate something to your guests). 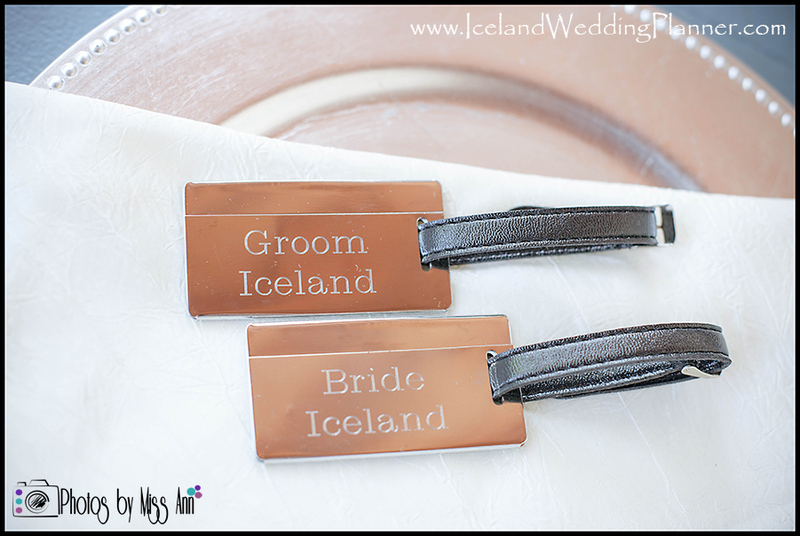 Our luggage tags were our wedding favors to our guests for our wedding reception at Hotel Ranga in Hella, Iceland. The front of our destination wedding luggage tags also operated as our seating chart (Iceland wedding place cards) and gave the Hotel Ranga staff information on each guest’s meal choice for that evening. Iceland DIY Details: Before our Seljalandsfoss wedding weekend, we had purchased 4 colors of metallic card stock; designated a corresponding color to go with the 4 main meal choices (Example: Gray = Salmon; Gold = Lamb; White = Vegan; Blue = Child menu), printed out our Iceland wedding logo (A?C) at the top and on the next line we put the guest’s name. 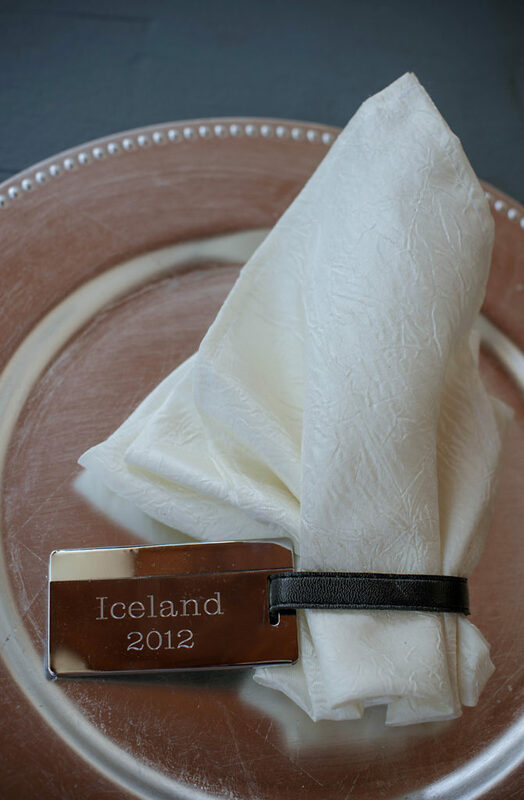 The final function of our Iceland wedding favor was as a place setting napkin ring/holder for our pin-tucked napkins. How fun, right? Finished photo example from our Hotel Ranga wedding here. Edible: Rock Candy Swizzle Sticks with a tagline that says “Married in the Land of Fire and Ice!” You could even go so far to actually pair it with something that relates to fire like hot sauce or matches in a vial. 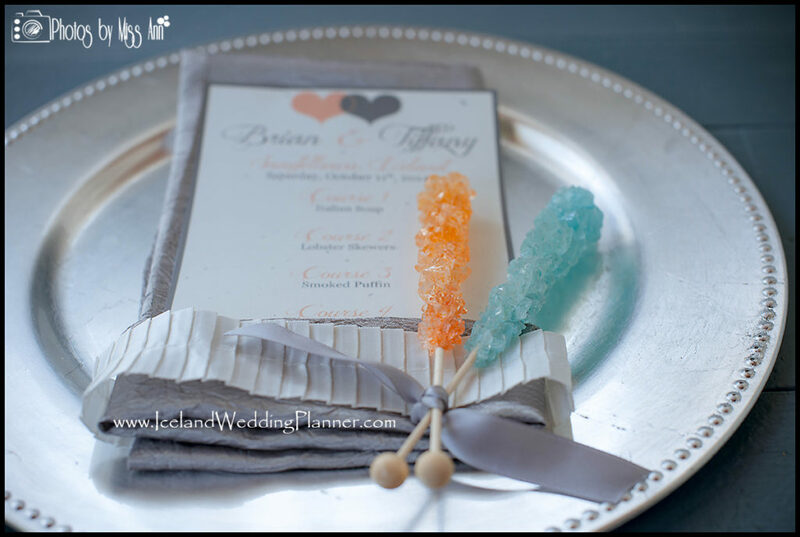 We used blue and orange rock candy swizzle sticks to emulate the glaciers and fire in our Iceland wedding photo examples. Practical Usage Wedding Favor: Luggage tags, Icelandic wool knit item ( everyone loves wool socks, right? ), moss candles, a game unique to Iceland, and frankly the possibilities are endless because Iceland rocks! 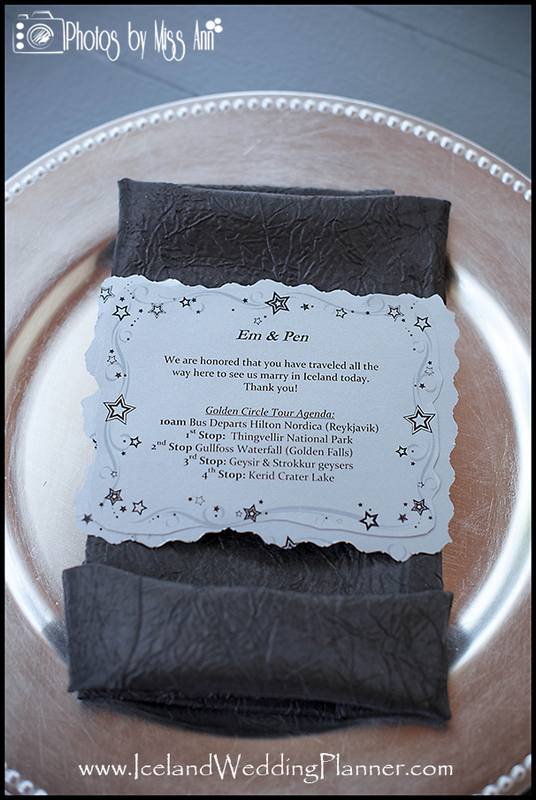 Having an item that is dual purpose allows your guests to really remember how epic your wedding really was later too. Sentimental: A gift certificate for your Iceland wedding guests to do a post wedding activity. Admittance maybe to Iceland’s Blue Lagoon? Rent a bus a day following for your wedding party to tour Iceland’s famous Golden Circle together as a group? Take a tour of Iceland’s other famous natural wonders such as the glacial lagoon, stunning waterfalls, black sand beaches, sod farms, boiling mud pots, lava fields, or glaciers? If you do decide to go this route make sure you let your guests know ahead of time. That way they can plan for it in their travel plans ahead of time and you are not disappointed that they have already done it. 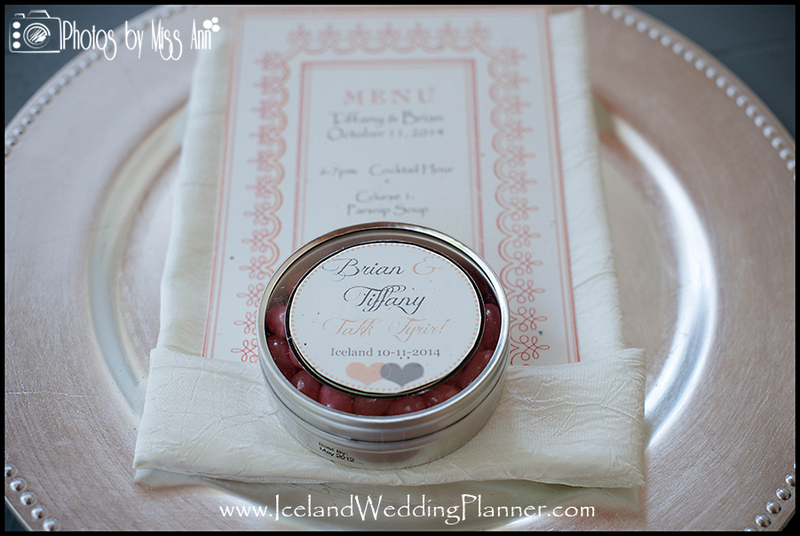 Fun Iceland Wedding Favors: If you’re not going to do a wedding welcome bag for your guests it would be really sweet to put together as your wedding favor to them a box or bag of Icelandic made treats (like candies, trinkets, coffee, lava rock/ash, Icelandic water, etc) or an Iceland Survival Kit. 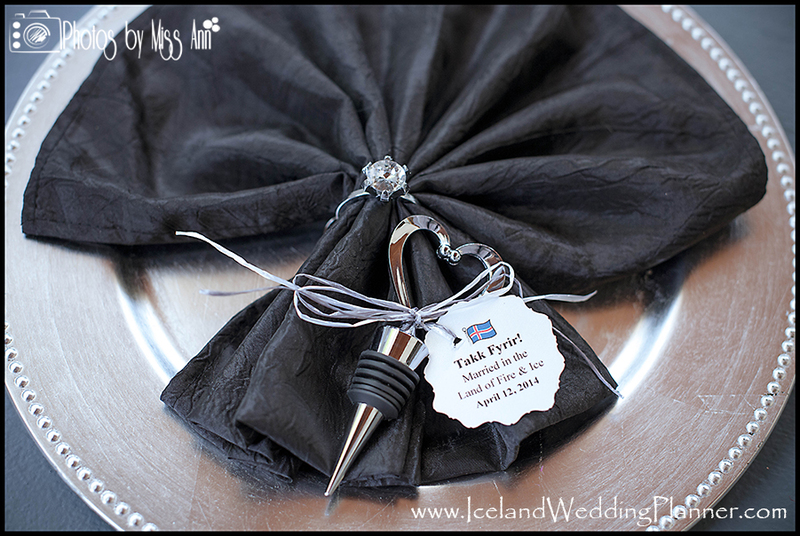 I would envision an Iceland Survival kit to be similar to our Iceland wedding guest welcome bag with inclusions to accommodate all ages, folks from all different climates and needs. 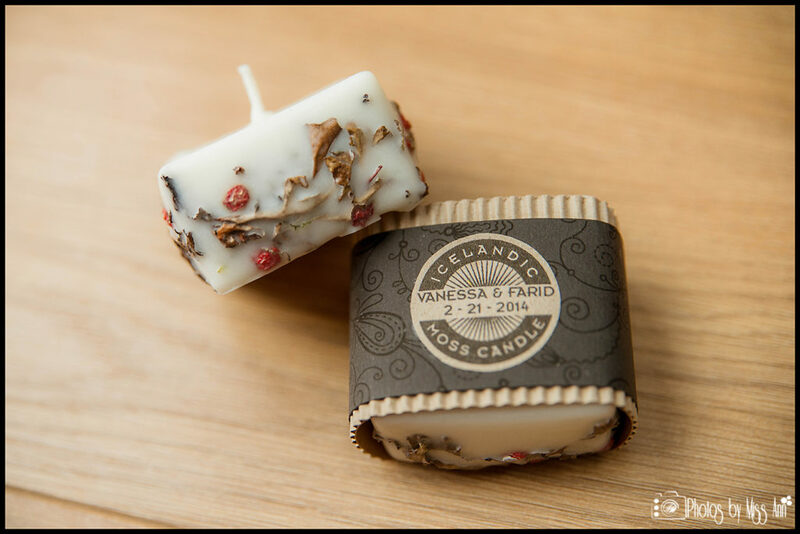 Other amazing options you may want to consider specific to Iceland: Krona key chain, wool bookmark, Icelandic moss candle, Icelandic wool blanket for your guests to each take home, lava rock mementos, etc! The possibilities are endless, be creative! 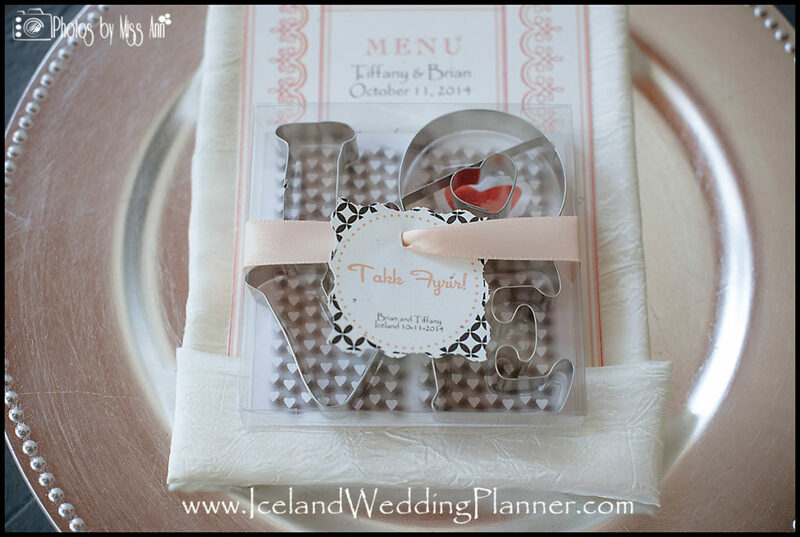 I hope that our post today on Iceland wedding favors generates your own awesome ideas for your destination wedding in Iceland! Chris and I would love to hear more about you and your big day in the making feel free to contact us directly here for more information!